In Feng Shui, the Gold Cow of Good Fortune, often found sitting on a bed of coins,is used to represent and attract good descendant's luck. This is so future generations will be blessed with abundance and prosperity. Dark Brown Ox or Cow, hanging. In terracotta finish. 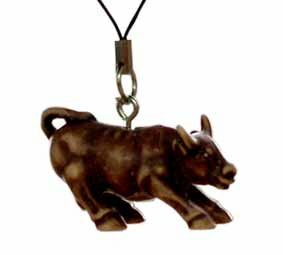 Small Ox hanging to hang on your bag or in car or indoors. The Ox is a hard worker and represents beneficial outcome of hard work.Comes packed in clear bag on black card.